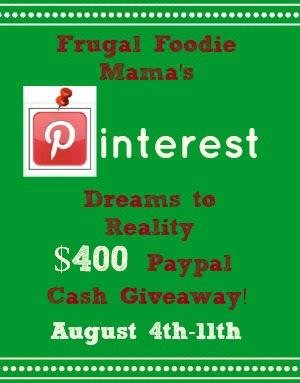 Frugal Foodie Mama: The Pinterest Dreams to Reality $400 Paypal Cash Giveaway! The Pinterest Dreams to Reality $400 Paypal Cash Giveaway! I knew a milestone like this was cause for a HUGE celebration on the blog. And when I say celebration, you all really know that I mean GIVEAWAY! I asked just *a few* of my favorite bloggy friends to join the party and help me in celebrating. How are we celebrating? By helping one of you make your Pinterest dreams a reality with a $400 Paypal Cash Giveaway- the biggest giveaway ever hosted on Frugal Foodie Mama! How many of you all have Pinterest projects and ideas that you have had pinned for months, longing to do them, but maybe the price tag is holding you back? Would $400 to spend any way and anywhere you would like help out just a little with that? Of course if you win, you can spend the Paypal cash any way that you would like. But how fun would it be to finally splurge on a little something you have had pinned away on one of your Pinterest boards?? If you do not have a Paypal account presently, you WILL have to set up one if you win. I will only be able to transfer the funds via Paypal. Paypal is great because it is accepted with most online shops and you can transfer funds to your checking account once you have connected the two. :) Pretty cool, right? Please read through ALL the giveaway terms and conditions below. I am a stickler for them. No joke, folks. *This giveaway is open internationally. All entries for the winner will be checked and verified, so please make sure you are doing what you are claiming in the Rafflecopter or all your entries will be voided. No funny business, folks. ;). By entering you give the right to use your name and likeness. Number of entries received determines the odds of winning. One winner will be selected. The winner will be notified via the email they provide, and will have 48 hours to reply to the email. If the winner does not reply back within the 48 hours, they forfeit the prize and a new winner will be chosen via Rafflecopter. This is a giveaway sponsored as a group buy, which means the bloggers pooled their money together to purchase this product for you. Paypal is not a sponsor of this giveaway. The cash prize will be sent via Paypal directly from Carrie of Frugal Foodie Mama. You must have an active Paypal account to receive the cash prize! Entries must come from your MAIN social media accounts, not accounts that have been set up separately just for entering giveaways. Entries from these types of accounts will be disqualified. Protected tweets do not count as an entry method for tweeting. Tweets must come from a public account. Bloggers in this group giveaway and their immediate family members in their household cannot enter or win the giveaway. No purchase necessary. Void where prohibited by law.